An online store is a complex thing; developing one from scratch can take months of hard work. Yet in the final analysis, most stores are very much alike. Shopify ($29 plus percentage per month and up, 30-day free trial) lets you create your own store with a minimum of fuss and hassle, and with lots of customizable options. Shopify lets you process credit cards using numerous gateways, and features easy PayPal setup. Unlike many Web services, stores don't generally offer free plans. Shopify follows suit, but neither does it offer a flat monthly fee for most plans. Plans start at $29 per month--about twice what competitors Goodsie and Magento Go charge--and Shopify also takes a 1%-2% cut of your sales on most plans (except for the Unlimited plan, which costs $179 per month.). You do get a 30-day trial period to evaluate the service. For your money, you get pretty much every feature you could wish for an online store. Shopify starts you off with a seven-step tutorial that shows you through the configuration interface and lets you configure products, credit card processing options, and more. Automated backups, a content delivery network, and 128-bit SSL encryption are included. A "getting started" tutorial, with tooltips pointing at the menu options you need to click, is integrated right into the admin interface. Some might prefer a video or a series of screenshots, but at least the information is right there where you need to use it. Shopify tries to be clever, but doesn't always get it right. For example, it correctly identified my location (Israel), but then decided to offer items in my store in ILS (Israeli Shekels) by default, rather than USD, the currency I wanted to trade in. It also set up automated tax collection whereby purchases from Israel would be automatically billed with a VAT percentage. Unfortunately, that percentage was wrong (16.5% rather than the actual 16%), but it took just a single click to correct. Adding products to Shopify is a painless process. Simply go to the Products page and click "Add new product." Most fields in the new product screen are self-explanatory and easy to fill out, such as Title, Description, and Weight. You also need to upload an image for every product, which does take a bit of time if your product images are large. Your store's general look-and-feel is greatly impacted by its current theme. Shopify has a vibrant ecosystem with lots of third-party vendors offering themes and "Apps," or Shopify add-ons. The Theme Store features both free and paid themes; themes start at $80 and run up to $180 per theme (compared to $35-$70 for a typical premium WordPress theme). Themes often offer additional customization options, such as control over the color palette used. You can also create your own theme from scratch, or based on an existing theme. All add-ons, themes, and developers go through an approval process the company says is rigorous, and that the merchant is always aware of what data they are granting access to. Much like the Theme Store, you can use Shopify's App Store to buy add-ons for your shop. Add-ons offer diverse functionality, from enhanced analytics, through loyalty cards, Facebook integration, and "roll-your-own" daily deals. While some Apps are free, most are offered on a paid monthly subscription basis (unlike themes, which are a one-off payment). Once you've added some products and set the general vibe for your store, you can configure payment options for your customers to use. 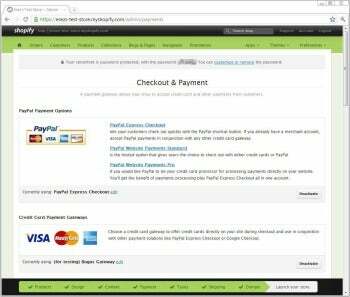 Shopify supports both PayPal and Google Checkout, as well as numerous credit card gateways such as Moneybookers, Chronopay, and more. If you wish, you can even accept COD (Cash on Delivery), money orders, or bank deposits. Setting up an online store still takes work and attention to detail, but Shopify certainly makes things smoother and handles much of the heavy lifting for you. If you don't mind the fees involved, Shopify is a solid option that could get you on the road to online sales that much faster. Shopify takes you step-by-step through setting up your very own online store, including credit card processing, inventory management, and more.